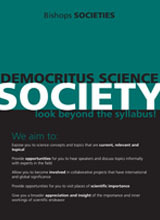 The aim of the Democritis Society is to stimulate and develop interest in science beyond the borders of the curriculum. This is accomplished through a variety of ongoing practical investigation and developmental projects, as well as a range of visiting speakers, special events and visits. The Democritus Society has had a very successful past year. We’ve strived to provide captivating evening talks, once a term, with topics ranging from Newton to astronomy. During open periods we have tried to host an environment of development and research for various projects, open to anyone, and for anything relating to science. Below are two short summaries from the two project leaders, Nicholas Hyslop (CanSat Rocket Project) and Taku Mtombeni (Hovercraft Project) to benchmark our progress for the forgone year. The Democratis Society CanSat rocket project has been a very interesting and ambitious one for us and has provided many challenges for everyone involved. The aim of the project is to launch a rocket using a system that takes Hydrogen Peroxide (H2O2) and decomposes it, producing a very large amount of hot gas which is then used to propel the rocket. This rocket would carry a small electronic device in a 330ml soft-drink can (hence CanSat) that would collect all the flight data and stream it to a computer. The can is then ejected out of the rocket and return to earth under a parachute. The H2O2 method is a largely unused technology – especially by amateur rocketeers – as it involves a complicated system of trying to pressurize and distribute the liquid rocket fuel through an engine mechanism, requiring quite a lot of complex calculations to get right. This ultimately provided two challenges: firstly it meant that it would be very difficult to engineer, and secondly there is a very small amount of information out there as to how to construct it. It is by far much more difficult than a simple solid fuel engine that you just light and stand back. But, in true Bishops style, we decided to charge ahead and do it anyway. And it has been greatly rewarding experience for all the people involved: namely myself (Nicholas Hyslop) and Jeremy Wilkinson (working on the rocket) and Scott Maslin (putting together the electronic CanSat). Currently we have finished all of the theoretical work – having finalised all the calculations needed to design the engine and rocket body systems – and have started work on building the test system for the H2O2. It has definitely not been without some hurdles. To try and obtain some high concentration H2O2 has proved quite difficult, as well as trying to cheaply fabricate the complicated silver wire mesh components – an absolutely critical aspect of the engine system. However, the project is starting to build some momentum, with the engine construction complete, I am very enthusiastic and excited to see this project get up and off the ground. You know what they say; the sky’s the limit. As a Democritus society project, the Hovercraft team has been working on building a functional hovercraft. Once completed the hovercraft will be used to aid in the teaching of Newton’s laws, pressure and friction to boys in the younger grades. There are even plans to offer the project to grade 9’s or 10’s and even host a bishops Hovercraft Derby. The Hovercraft is of surprisingly simple design. It has a large circular base with a skirt attached to it in order to help with airflow. The Hovercraft will be powered by air and will use a leaf blower as its engine. The process of taking an idea through the process of design and actually building it has been an insightful experience for all involved. At present the Hovercraft requires one more part before it can be completed (a T-Bolt Band Clamp). Upon completion we hope to use the project to showcase the society. As can be seen from the reports here the society is developing into a vibrant and challenging arena where boys are engaging in first hand discovery and development of ideas and theories. For the boys to have got the rocket test motor through the design and fabrication phase is a significant achievement. It has been a delight to me to see the impressive level of operation that our boys are capable of and I am excited about what lays ahead this year. There are a number of ideas which are still on the back burner and so for any others who are not yet members in the society there is huge scope for further involvement.